Until December 17th, all 6 of our branches across the Uxbridge & Hillingdon region will act as Toy Collection Points for Great Ormond Street Hospital’s Radio Lollipop, as part of a charity incentive initiated by Uxbridge branch Funeral Arranger Suzette O’Rourke. 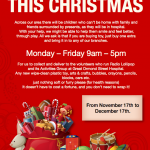 Suzette explains, “This Christmas I really wanted to support Radio Lollipop, the hospital radio and activities group based at Gt Ormond St Hospital. It has no funding by the NHS and is run by volunteers, and charitable donations. More important than just playing radio requests for patients, their volunteers go on to the wards and help children progress and feel better through play: mainly something sticky, glittery or shiny! Even through serious illnesses, children of all ages love to play, it helps them relax, laugh, and maybe think about something else, rather than the fact they are in hospital. Although parents are encouraged to stay with their children as much as possible, not every child has visitors, or surprises or toys. The idea of the Drop-in Toy Campaign is that if you’re shopping for a child this Christmas, please just buy one extra toy and donate it here. All gifts will be donated to Radio Lollipop, be it a box of crayons, tube of bubbles or a tub of glue. The toys don’t have to cost a fortune, and every little helps. Soft cuddly toys cannot be accepted, due to risk of infection, but anything to do with crafts, lights, wipe-clean plastic bricks, cars or even paper to draw on, will help.